Many of us suffer from sleep deficiency or sleep disorders, which influences our entire life and health. Namely, according to the Center for Disease Control and Prevention, insufficient sleep is a public health problem and people have spent thousands of dollars and hours trying to find a solution to their problem. You may have tried numerous ways as well, such as a better mattress, banana tea and other remedies, medications or relaxation techniques. If you haven’t solved this issue yet, then, this article will save you! Probably the majority of you do not know that the quality of the air can affect their quality of sleep as well as their overall health and wellness. Mold and other airborne contaminants can be a major underlying factor in illness and disease. As probably in all cases, we eventually turn to Mother Nature and try to find the solution in its numerous plants and herbs. This is not an exception. Undoubtedly, the more indoor plants in your home, the purer air you will breathe. Moreover, you will see that the annoying symptoms you’ve been experiencing for years will begin to improve. NASA named the English Ivy the number one best air-purifying plant. This plant is classy and easy to grow. Research has shown that this beneficial plant in the home helps to reduce airborne mold by up to 94%! It is especially useful in the case of asthma or breathing problems at night. As allergies, asthma and breathing problems occur mostly due to contaminants in the air, this affordable plant may significantly improve the quality of your sleep. 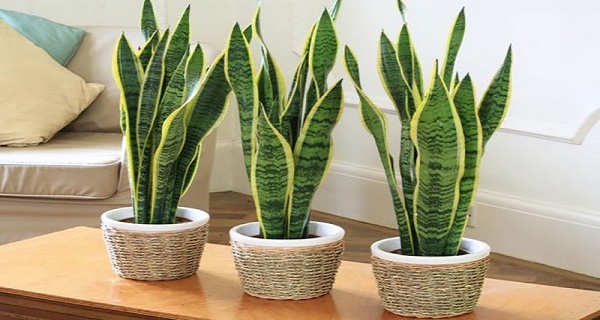 As they are easy to keep alive and are great for interior decorating, snake plants are already popular indoor plants. These plants improve air quality by filtering the oxygen and thus improving the overall atmosphere of a home. According to some studies, the snake plant may help to avoid eye irritation, respiratory symptoms and headaches and may also improve productivity levels. The Aloe Vera plant is also known as the ‘plant of immortality’ and can be reproduced easily. This excellent indoor plant contains numerous beneficial properties, and it is very easy to be kept alive. Aloe Vera was also on the list of top air-improving plants by NASA. This plant has been shown to emit oxygen at night, which may help with insomnia and improve the overall quality of sleep. Hence, spread this popular medicinal plant all over you house and enjoy its benefits! The smell of this exotic plant can provide numerous benefits. It reduces stress and anxiety, but it also improves the quality of sleep, as well as the alertness and productivity the next day! Just smelling this plant may help to reduce anxiety and stress. You have probably used and felt all the benefits of the lavender oil, but growing a lavender plant will provide extremely positive effects as well. Lavender, in all its forms, has been shown to help reduce anxiety and stress, slow heart rate, improve sleep and may even help reduce crying in babies.